Emergent Media Center Director and Associate Dean Ann DeMarle speaks at the Champlain College Career Collaborative’s inaugural 2016 Fall Career Conference Monday morning. 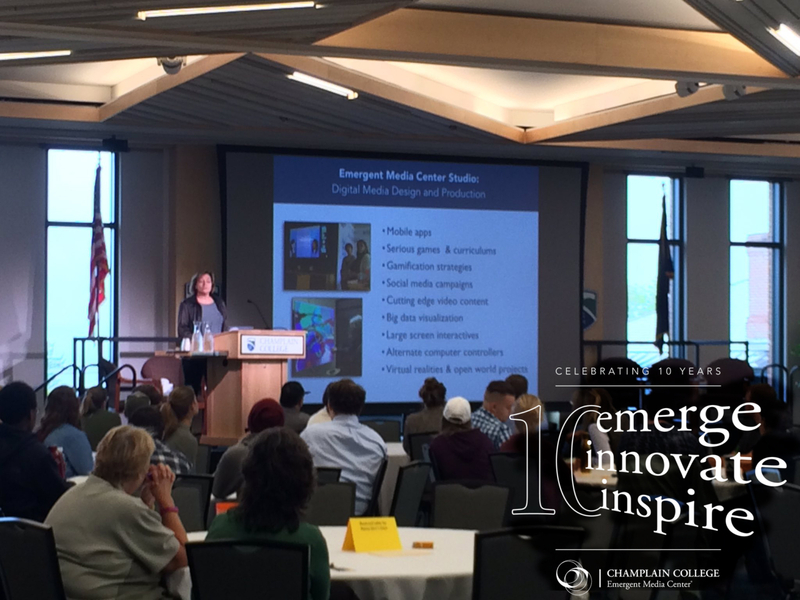 BURLINGTON, Vt. — Champlain College Emergent Media Center Director and Associate Dean Ann DeMarle took center stage Monday morning at the Career Collaborative’s inaugural Fall Career Conference to launch a year-long campaign celebrating the 10th anniversary of the EMC and its programs. “We’ve done a lot in the past ten years. And we are celebrating this entire year – online and in person – collecting the wisdom of our community on the topics of high impact learning, career innovation, and future technologies”, said DeMarle. Since 2006, the EMC has grown from six original student employees and two staff members to employing approximately 125 student positions a year. Over 500 students and 38 faculty and staff have collaborated on over 32 projects spanning five continents. At Monday’s Career Conference welcome, which took place in the Champlain Room in Champlain College’s Center for Communication and Creative Media, DeMarle noted student retention as a major factor in the EMC’s ability to make an impact. High graduation rates have translated to high employment figures as the Emergent Media Center boasts 95% job placement locally at places such as Dealer.com, Burlington City Arts and Free Press Media as well as internationally at Apple, Google, Microsoft, Ubisoft and TellTale Games. Aside from the MFA & MS Graduate programs, the Emergent Media Center features the EMC Studio, which employs students to create digital media ranging from mobile apps, serious games and game strategies to large screen interactives and virtual reality for businesses, non-profits and government agencies. The EMC also reaches out to the Champlain College community through its MakerLab, a physical prototyping lab with a host of devices from high tech 3D printers to low tech hand tools. Workshops and individual classes give students across campus the chance to express their creativity.